First, a quick bit with LO talking about his wedding, one of the most uncomfortable minutes of video I've ever shot. Not because of the subject matter, but rather the pushing and shoving going on as people jostled for the best angle. My favorite line: When asked if the presence of Khloe (and the cameras that follow her) would be a distraction at Staples, LO smiled. "That's a Laker game, with or without her there. It's still an event." Fisher talks about distractions, and while he notes that the Hollywood media is a different animal, it's not something that playing in LA doesn't prepare guys for. He expects to, along with Kobe, keep an active eye on things and help the team maintain focus, just as he would in any season. written by the Kamenetzky brothers. Like most things involving the Lakers, Media Day always operates on a different level for the purple and gold than it does for other NBA franchises. This year was no different. The typically massive Katamari ball of humanity, microphones, cameras, and notepads (the technical term starts with "cluster" and ends with a word I can't use in this space...) was only enhanced by the presence of entertainment media hoping for a piece of post-wedding analysis from Lamar Odom. It is, in short, an eventful way to kick off the season, but not exactly an environment conducive to gaining deep insight into the state of the squad. * Entertainment media operates in a different way than sports media. Those dudes are sharp elbowed and aggressive with the camera in the big scrums. Generally speaking, I really hope today's events put us on the downhill side of the Odom/Khloe Kardashian story. * Andrew Bynum looked strong, fit, and eager to start the season, for what it's worth. He said he'd be wearing a brace on his right knee (the one he hurt last year) for the rest of his career, and may experiment with wearing one on each leg, protection on the left being precautionary. Whatever works. * For the first time since I started covering the team, Kobe Bryant wasn't the center of attention. Not that he was standing awkwardly on the fringes David Monds, Michael Fay, and other camp longshots, but LO and Ron Artest drew bigger crowds. "I miss you guys," joked 24 when asked about the new (and temporary, I'm sure) media pecking order. * Cutting his hair may be the smartest thing Sasha Vujacic has ever done as a pro. Silly as it sounds- and it does sound silly- his mane had started to overtake his game, adding a persona that was doing nothing for his on-court performance. The haircut represents a fresh start. As an interesting and laudable side note, he had hoped to donate his shorn locks to charity, but was told his hair was about two inches too short. Good for him for thinking in that direction, though. * Watching guys handle the circus today, I'm even less concerned than I was before that external issues and distractions will be a problem. In context, the addition of Artest or LO's big summer aren't out of line from other Incredibly Big Lakers Stories from days gone by. Click below for some of the video fun. LO, Derek Fisher, Sasha, and Bynum. Plenty more to come over the course of the day, as well. Vujacic, on everything from cutting his hair to his first post-title summer to his hope for a bounce back season. He was very candid in speaking about his performance last season. "I'm not proud of it," he said. And apparently, once Sasha went back and watched the tape, even he was annoyed with how much he played with his hair. Bynum goal is to be an All Star. This is why I love Ron Artest, he is a "people" person in every since of the word. And he is very humble. I hope Jordan keeps a good attitude throughout this season. Because Shannon Brown is working hard as well, yet I believe the starting pg position sans Fisher is his to lose. Adam Morrison may not show much personality in front of the cameras but given the chance I believe he can be an offensive Spark off the bench. Today is media day in El Segundo, and for the first time since Shaquille O'neal left, their were more cameras around a player that was not named Kobe Bryant. Lamar Odom, due to his recent nuptials to Khloe Kardashian, had what looked like a "circus" of reporters surrounding him, as the Lakers gathered together for their first step toward defending their NBA title. It's 50 years in LA, let's celebrate with another one. The road to 5 starts here. Lakers power forward Pau Gasol had quite a summer. Playing a crucial role in L.A.’s championship run in June would have been enough to keep the seven-footer smiling in the first place, but going on to lead his Spanish National Team to its first EuroBasket title was the proverbial icing on his cake. In the midst of an always-hectic media day, we posted up next to Gasol to talk about his “offseason” in Spain and Poland, his mindset in terms of defending L.A.’s championship crown, playing with three other outstanding big men (Andrew Bynum, Lamar Odom and Ron Artest) and more. While addressing a thirsty group of reporters, Kobe Bryant alluded to his calm, physically restful offseason, said that the Lakers are 100 percent focused on repeating and continuing to improve, and declined to acknowledge any off court distractions. Lakers center Andrew Bynum spent most of his offseason training in Atlanta, where he told us his primary focus was “getting my base back.” Bynum said that his workouts included a lot of work strengthening the muscles around his knees, and declared himself 100 percent healthy. He also talked about his personal goal for the 2009-10 season and what is was like scrimmaging against Ron Artest. Shannon Brown came to the Lakers in a February 2009 trade from the Charlotte Bobcats, then promptly showed L.A.’s operations office exactly why they’d coveted his combination of athleticism and skill, particularly in the playoffs. As such, Mitch Kupchak and Co. re-signed Brown subsequent to the season, and are looking forward to seeing him grow even further after a full summer of digesting Phil Jackson’s offense. Brown mentioned the benefits of coming into training camp with the team when we spoke to him at media day, talked about what he added to his game and gave a quick review of Jay-Z’s new album. By Debby Jennings, Assoc. AD for Media Relations University of Tennessee Lady Vol basketball has added 14 more television dates to its 2009-10 schedule to bring the current number of TV games to 22. Eight contests had previously been slated for national television including: Nov. 15 Baylor (ESPN2), Nov. 17 vs. Texas Tech (ESPNU), Dec. 6 Texas (ESPN2), Dec. 13 vs. Rutgers (ESPNU), Dec. 19 at Stanford (FSN), Jan. 3 Oklahoma (ESPN2), Feb. 8 at Vanderbilt (ESPN2) and Feb. 22 LSU (ESPN2). On Tues., Sept. 29, the Southeastern Conference announced the comprehensive regular season television package for women's basketball and the Lady Vols picked up the additional dates. They include: Jan. 7 South Carolina (FSN), Jan. 10 at Mississippi St. (SEC Network), Jan. 14 at Florida (CSS), Jan. 17 Vanderbilt (ESPNU), Jan. 21 at Georgia (FSN), Jan. 24 at LSU (ESPNU), Jan. 28 Auburn (CSS), Jan. 31 at South Carolina (SEC Network), Feb. 4 Arkansas (FSN), Feb. 11 at Mississippi (CSS), Feb. 14 Florida (SEC Network), Feb. 18 at Alabama (CSS), Feb. 25 Kentucky (FSN) and Feb. 28 Mississippi (ESPNU). The expanded coverage from the SEC package makes it possible for Lady Vol fans to watch every conference game in the coming season. Lakers.com: The Los Angeles Lakers have signed forwards Tony Gaffney, David Monds, Mickael Gelebale and Michael Fey, as announced (on Monday). Per team policy, terms of the agreements were not released. Gaffney, an undrafted forward out of Massachusetts, finished his senior year at UMASS averaging a double-double with 11.5 points and 10.2 rebounds per game. The 6-8 forward was ranked 3rd in the nation in blocked shots (3.8) and was named the 2009 Atlantic 10 Defensive Player of the Year. Most recently Gaffney was a member of the 2009 Lakers summer league team where he averaged 3.8 points and 2.8 rebounds in four games played. Monds, a 6-9 forward out of Oklahoma State, was a member of the Lakers 2009 summer league squad where he scored 14.0 points and pulled down 5.2 rebounds in five games. The Georgia native spent last season playing in the NBA Development League as a member of the Albuquerque Thunderbirds where he averaged 13.4 points and 9.6 rebounds before finishing out the season with the Dakota Wizards. Gelabale, a 6-7 forward from France, finished the 2008-09 season as a member of the Los Angeles D-Fenders where he averaged 16.0 points and 4.3 rebounds in six games played. Prior to his stint in the NBA D-League, Gelabale spent two seasons (2006-08) with the Seattle SuperSonics where he averaged 4.5 points and 2.1 rebounds in 15.6 minutes. Fey, a 7-0 forward/center out of UCLA, played all four seasons at UCLA where he averaged 5.2 points and 2.7 rebounds while shooting 54.6% from the field. The former Bruin spent the 2008-09 season playing for Al Shabab (United Arab Emirates). The Lakers training camp roster now stands at 17 players. Media day is still three days away, but that didn’t keep Phil Jackson from sitting down at L.A.’s practice facility on Friday to provide a little teaser for a hungry group of journalists that assembled in El Segundo. It was a busy summer in Laker Land, featuring the 15th championship celebration for the franchise, the return of Jackson for another run, the acquisition of Ron Artest, the re-signing of Lamar Odom and Shannon Brown, Pau Gasol’s finger injury and subsequent MVP award in the European Championships, an assemblance of most of L.A.’s young players at the practice facility and, sure, Odom’s weekend wedding. - The Coach opened by answering a question about his T-Mobile commercial, citing that he goes “way back” with Jesse James because James was a companian of Dennis Rodman’s. Your usual soft opener. - Jackson neglected to talk about his contract after the coming season, saying he hasn’t talked to Jerry Buss. - Jackson agreed that his frontcourt foursome of Bynum-Gasol-Artest-Odom is easily the most talented he’s ever had, and cited the Portland team in 2000 as the last big foursome that had similar on-paper talent. - On distractions regarding certain players’ off court interests: “It will be something we have to talk about. There’s a certain amount of privacy that we have to demand from (the players) and I think these guys are professional. They’ll understand it.” Jackson said one difference between his Bulls days and now is the media climate, including Twitter, TMZ and constant internet coverage. - Jackson said that he’s concerned about Sasha Vujacic’s mindset. He thinks he’s the best shooter on the floor, but needs to rebound from a mental standpoint heading into the season. He thinks the Slovenian situation was difficult, but hopes Vujacic can use it as motivation. Phil added, “We asked him to cut his hair and he did.” A psychological fresh start? “Sasha played with his hair last year more than he did on the court,” Jackson quipped. - On Twitter and social media: “I think it’s wonderful in our society that we’ve had (the ability to access) so much information for free. A lot of it ends up just being gossip or heresay, so it makes our society more personality oriented. From that standpoint there’s a negative, but from a positive standpoint there are some things that are very good. As far as Twitter goes, Jeannie (Buss) uses it and thinks that it’s a good source of (information) and wants me to start, but I’m saying no. More to come next week from what’s shaping up to be quite an interesting ride. The Lakersnation.comMyFoxHouston: Monday Los Angeles Lakers star Kobe Bryant was in Houston for a two-hour workout with Olajuwon. Olajuwon said Bryant reached out to him for help with his moves in the post. “He gave me the biggest compliment,” Olajuwon said. “(He said) You are the best (at the) mid-post and post move. Olajuwon said his style of play in the paint is really suited for a guy like Bryant. “In my mind most of my moves for a guy (with) that agility can use it better than the big guy,” Olajuwon said. “Because my moves are not really for the big guy. “It’s for the guards and small forwards. So he would benefit most on the post because of his agility. Olajuwon expects Bryant to be even better than he was last season when he led the Lakers to the NBA Championship. “Adding those moves to his game, watch out for him this year,” Olajuwon said. “I understand his dedication. His desire to win and stay on top. By the way, Olajuwon said he would never have held one-on-one sessions like this if he was still playing. Lebron James on the View: My favorite team to play against is LAKERS"
Lebron admitted his favorite team to play against is the Lakers. Yea we know Lebron, because you understand that for your generation Kobe Bryant is the best in the business. The Lakers are going to be ready! I wasn't sure how Artest trained, or if he was truly dedicated to it, and he is! He will leave the game as the greatest player ever! His name is Kobe Bean Bryant! Understand that you don't have to like him as a person, but you cannot DENY his passion and will to win! 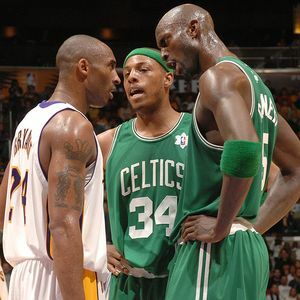 Pierce declares Celtics as "Team to Beat"
First KG, now Paul. The Celtics have a liking for talking… a lot. Oh yeah, we hate the Cetlics. So let ‘em hear it Lakers Nation! Yahoo: The Boston Celtics open training camp next week with a new roster and the same confident attitude. Forget that the Los Angeles Lakers are the NBA’s reigning champions. Paul Pierce(notes) is already predicting another title for the Celtics – provided, of course, they stay healthy. Pierce was speaking from New York where he was promoting the launch of his new “The Truth on Health” youth initiative. The program includes a web-based club, FitClub34, that provides children with resources to become more active. Related CoveragePlay Fantasy Basketball ‘09 More From Marc J. SpearsPierce angry about replacement refs Sep 24, 2009 Curry declares himself the rookie to beat Sep 24, 2009 Poor health doomed the Celtics’ own hopes last season. All-Star forward Kevin Garnett(notes) missed 25 games, including the playoffs, because of a right knee injury that eventually required surgery. Role players also were in and out of the lineup as Boston went on to lose to the Orlando Magic in the Eastern Conference semifinals. Pierce said he barely watched the Lakers beat the Magic in the NBA Finals. After the series was over, he tweeted, “Looked like a German shepherd vs. a poodle. That’s OK the Rottweiler Celtics will b back in 2010. While growing up, Taber Spani didn't go to school. Instead, the classroom came to her. The Tennessee women's basketball freshman and her four sisters were home-schooled. In their case, it meant scattering to five different parts of their Lee's Summit, Mo., home and watching DVDs provided by Pensacola, (Fla.) Christian Academy. "They'd set up a camera in the back of the classroom,'' the 6-foot-1 guard said. "So you'd kind of watch your classes and then you'd have all of your homework and all of your tests and my mom would oversee it." Spani still was able to play basketball. Since mom didn't play teacher's pet, there was no cutting corners on her education either. "For me, it was built-in,'' she said. "But I think it would take a lot of discipline, just because when you're by yourself, it's always natural to not want to do something. I loved it." Along with diligence, Spani has a built-in devotion to family and football, along with a desire for her faith to resonate in her life. Q: Are you a big football fan? A: Saturdays, if I'm not doing a workout, which I'll probably come in and shoot, but after that it's reserved for football. Q: What position would you have played? A: I'd either have been a linebacker - because that's what my dad was and I love to hit, I love that part - or I'd be a quarterback." Q: Your dad (Gary) was a star player at Kansas State and with the Kansas City Chiefs. Did you hear a lot of stories growing up? A: When I was born my dad had already been retired a couple of years. It's mostly from people ... old buddies. They'll just start talking about it. My dad was ferocious. He was a worker. He was the ultimate worker. He'd run 50 40s every Wednesday in college. He didn't start, I don't think, until maybe midway through his freshman year. He didn't get a chance. And then somebody got hurt and he went in and he had 20-some tackles his first game in college. He kind of took off from there." Q: You told me before of your admiration for Florida quarterback Tim Tebow. What is it about him? A: What I love about him is he was home schooled. His beliefs are very similar. Most importantly, it's just the way he's an all-out leader. I love his passion for the game, the way he absolutely leads his team. He's going to do whatever he can. Maybe people will say he's not the most skilled athletically, but he gets the job done and he's going to will his team to victory. I kind of want to be the Tim Tebow of women's basketball - use my platform to influence people." Q: What do you think when you hear about all of the mission work he does? A: I love it. Obviously his parents, their missionary work is a tremendous outreach. I don't know what I want to do here, but I want to get involved somehow. I just feel like as athletes, especially at top programs like Tennessee, you only have four years. We have a platform, We have a chance to influence people. If you don't take advantage of that, I think that's sad, and I think that's really selfish. I'm going to do whatever I can. Obviously it comes hand-in-hand with performance, so I'm going to work my tail off on the court." Q: How do you want your life to reflect your faith? A: I want people to see Jesus through me. I want it to be clear who I am. I know that some people aren't going to agree with that but that doesn't really faze me. I want to be known as someone who's the ultimate competitor but loves you to death." 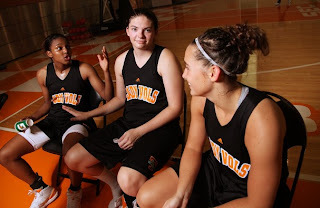 Dan Fleser covers the Lady Vols. He can be reached at fleserd@knoxnews.com. Tennessee moved a step closer to the official start of women's basketball practice next month by convening their first full-team workout on Thursday. Since fall semester began, the Lady Vols had been conducting individual workouts that involved no more than four players at a time. "We worked on all these things in individuals,'' freshman Taber Spani said, "but now it's understanding it in a team setting." Actually the Lady Vols spent most of the individual sessions introducing and drilling on defensive concepts. They will use the team workouts to start playing catch-up on offense. Team workouts also introduce the use of male practice players. "The size of the guys down low defensively surprised me,'' freshman Faith Dupree said. "I've played some big people, but those are the biggest I've played." UT coach Pat Summitt likely will be more vocal as well. During individuals, she spent more time observing while her assistant coaches directed the drills. Dupree was happy to report that she survived a Summitt scolding on Thursday. "You know what? Bring it,'' Dupree said. "I'm going to mess up, and she is going to tell me what I did wrong." Check out this star studded roster on picture day! And Amber Gray looks great! God is so good. Whats good man? This is your friend (and since I’m a die-hard Lakers Fan, WE ARE FRIENDS) Terence Turner. I felt the need to introduce myself and thoughts now, because it might be too late by…lets say…next week. First of all, thank you for re-signing with the team. It was touch and go for a minute, but wisdom won that battle. You couldve signed with D. Wade, but what would that have done? Exactly. That gamble wouldve not worked in your favor. You played your cards right. Honestly though Lamar, it looks like you have gone from playing poker, to playing Russian Roulette with someone who has a “slot machine” state of mind. I will explain this analogy later on. Recently you have been all over the entertainment blogs and shows for your impending marriage to Khloe Kardashian. I dont know what has all transpired within the last couple of weeks with you guys dating, but Lamar don’t do it! I’m Keith Sweat-begging you dude, don’t do it! Lamar, out of all the chicks with fame, you choose a Kardashian sister. I am reluctant to use the word “celebrity” because she is only known by association. Her sister gets mutted on tape, and next thing you know, we are subjected to the lives of a family that does not add anything to society. And you choose Khloe. The desperate Kardashian. She is the 2009 Jan Brady…..Always trying to do something to stress her relevance. I don’t know what your motives are behind this move. More notoriety? Maybe. I mean you do play on the most popular basketball team in the world. That team happens to play in Hollywood. I guess you are hoping that Khloe can keep you relevant off the court, as Kim does with Reggie Bush. When you are on TMZ, more than Sportscenter, thats a problem. Money? Maybe. But you did just resign for $30 million-plus. Post game kisses like Kobe? Maybe. You want to branch into TV? Maybe. But that isn’t you dude. You aren’t that type of player. You are a star, but not a superstar. You are a good player, but you dont influence Sports and entertainment like that. Thats not a knock against you, thats just me being honest with the fact that being “That Guy” isn’t your lane. Somebody has to play the background. Now let me explain my analogy from above. Playing Poker: That little dance you did with the Lakers during the offseason. You knew the dealer had a the better hand, but something inside of you decided to raise the stakes. You were almost a Straight Flush (like Ariza), but the organization decided to play with a full house. Playing Russian Roulette: This relationship with Khloe. You can be lucky and survive, or this bullet can cause some damage. Just make sure you deliver when you are suppose to. If you start falling off because of this, dont think you are above being traded. A certain player on your team will be a free agent soon, which means they will have to open the checkbook. When the Lakers look at their account, will they see a debit or credit next to your name? Just something to think about. Because whether you realize or not, you will be the first to go if the Lakers decide to make some moves this year. Someone who has a “slot machine” State of Mind: That would be Khloe and her attempts to be like her sister. Khloe has been publicly linked to at least three ball players in the last calender year: Rashad McCants, Derrick Ward, and now you. Again, emphasis on the publicly. Khloe is a desperate groupie who has a thirst for having the things her sister has. She will never be more than a trophy. She keeps putting coins and investing in this same machine, hoping her numbers will line up. Oddly enough, she has finally hit Lucky 7s, which happens to be your jersey number. Anyhow Lamar, I just wanted to hit you up and let you know about a few things on my mind. I know you are probably busy getting ready for this wedding and training camp, but please keep this in consideration. Man to Man – This is not a good look at all. Fan to Man – Make sure you handle your business on the court. Kardashian sisters are like Kryptonite. Andre 3000 said it best….Too soon! Dont do it! Reconsider! Read some litera – ture on the subject!!! LakersNation it's almost that time again. In 7 days our world champion LA Lakers will take to the "court" for media day. All the guys back (sans Trevor) in the same setting to begin the 2nd of 5 possible titles. When the media lights go off (which is never in LA) the battle will begin: Adam Morrison vs Sasha "mis-chine" Vujacic! Nation this is a legitimate battle this year. Sasha will not be able to rest on his knowledge of the triangle alone. he is going to have to bring that 3pt shot to the court. Summerleague Highlights Adam Morrison has his "leg" back and that stroke is looking good. Watching Adam during summerleague play (it's to be considered) because Adam was the "name" on that team. According to Lakers.com Morrison averaged 20.8pts/5rbs a game. He shot 42% at a clip of 29-69 from the floor, including 8-19 from 3. Most importantly he was showing no ill affects of that acl tear over a year ago. Sasha on the other hand, struggled the entire 2009-2010 season, including the playoffs. I won't even take the time to put up Sasha's numbers because if you are a fan, you don't want to be reminded of those performances. His summer has not gone the way he hoped. He went to play for his "home" squad, the Slovenian national team dismissed him. Sasha was having issues with his knee and felt that the team doctors for the National team was not giving him the proper treatment, so they sent him home. So his season was probably the worst he has had since getting consistent playing time, ends up getting hurt, so dismissed from the National team (all while being a world champion), so your confidence may be shaky right now. But I will say this, he is passionate about this game. He scrambles hard on the defensive end, he just needs to play under control. Sasha better not sleep on Adam, we know they have had a few "verbal" confrontations in practice Adam vs Sasha so I expect this to be a great battle to see who becomes Kobe's backup...lol. Get Ready for the WNBA Conference Finals! SparksNation stand up! The L.A. Sparks are one series away from the promise land. This time the road to the finals run through the "desert" and believe me the Mercury are thirsty. Even though they are only a year removed from the championship, the 3 headed monster of Diana Taurasi, Cappie Poindexter, and Penny Taylor are in desperate search of that opportunity again. They have one problem, for the land of sun, beaches and pool parties, the Sparks are more thirsty than they are. 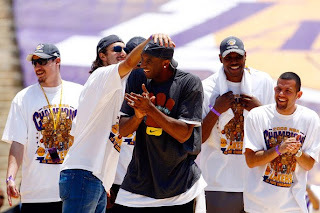 It's been 7 long years since a championship came to the L.A. basketball community and coincidentally, the last time the Lakers won a championship, so did the Sparks! The Lakers with a three-peat, and the Sparks making it a back to back championship celebration. So if history repeats itself, there is about to be another celebration in L.A., this time for the Sparks. It's only fitting that the "Queen" of the WNBA and USA basketball(which doesn't get enough shine in my opinion) finish her career holding that WNBA trophy. And this is the year to do it. I think a lot of us are so caught up in the fact that this is Lisa's last year (as we should) that we are forgetting that with another Sparks title, Tina Thompson will have an unprecedented 5 WNBA titles, which is the most of any WNBA player, active or retired. Now that's putting in work. Had she been our "6th woman", she would have had that award this year as well. What I'm loving most, is watching this team play with everyone healthy. With this entire team intact, the Sparks have lost only 3 games (?) including the playoffs. The challenge against this Mercury team is not about our DEFENSE, yea you read right, the challenge is us scoring against the ZONE! Since the beginning of the season the Sparks have yet to figure out how to score against an opponents zone. In the first game of the season versus Detroit, the Sparks came out and began to destroy the Shock (the Shock was playing one on one..lol) and then the dreaded zone came out, and it was turnover after turnover. We have a zone buster and her name is Noelle Quinn. Noelle is the starting point guard w/ the four olympians, they are going to leave her open and she needs to hit the shots. One thing is for sure, they will double Candace and Lisa down low, which it's funny because Tina Thompson can lead this team in scoring on any given night. Delisha Milton Jones needs to begin and end this series as D Nasty. DMJ is like Lisa's little sister, who loves to "take over" Lisa's fights for her...lol.You would have noticed that during the regular season when Lisa was out and we were battling the Storm. DMJ and Lauren Jackson stayed into it. She is like the Dennis Rodman on the team. We can allow Cappie all the shots she wants, but you must not allow Tangela Smith, Dewanna Bonner, or Tameka Johnson to beat you. Tameka did damage against us during the regular season, so we must make her a non factor. Anytime they have her matched up against Noelle Quinn, I would take her to the block, and force them to help, leaving an olympian open...yea I like those odds..lol. Betty Lennox is and should have a field day if she can play under control versus Cappie. I say that because Cappie is a scoring machine, but she is known to get into foul trouble as well. We will be watching the two best two guards teh league has to offer. It will be like watching Kobe and Ray Allen on the court. But when it's all said and done, I expect the LA Sparks to be marching into the finals. Candace Parker will be leading the Sparks in scoring and rebounding. (The woman is simply the best) Everyone can see she got her "swagger" back. Now if I can see that "R U Serious" face R U Serious 1:15 it wil all be complete. Go ahead Candace, all the veterans are on your team, so show no mercy to the opponent. Will Candace get to play against Detroit after all this season? It may not be as bad, seeing that Pierson is out with a shoulder injury, but they are certainly plenty of storylines their and the media will have a field day. The road to the championship will not be easy, but it will BE! ESPN: Pau Gasol had 18 points and 11 rebounds to lead world champion Spain to a 85-63 win over Serbia in the final of the European basketball championship Sunday. The victory gave Spain its first European title after six runner-up finishes, including a one-point loss two years ago to Russia in front of its home crowd. The Spaniards dominated from the start at both ends of the court, playing pressure man-to-man defense and getting out on the break for easy baskets to take a 15-point first quarter lead. Serbia never recovered. Gasol, a star with the NBA champion Los Angeles Lakers, scored down low and blocked three shots on his way to winning the tournament MVP honors. Guard Rudy Fernandez chipped in with 13 points for Spain, while Uros Tripkovic led Serbia with 15 points. Kenyon… The Lakers are the world champions. They’ve beat you two years in a row. Maybe it’s time to stop talking? 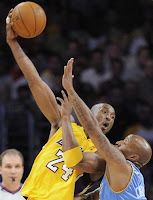 RealGM: Nuggets forward Kenyon Martin says the team feels as though they are better than the defending-champion Lakers. Martin was asked by 104.3 The Fan in Denver what the team learned from their deep playoff run this past season. “That you have to play on a consistent basis throughout the regular season and just better your position. Just learn from the things we did right last year and learn from things we did wrong, but we had a great run,” Martin said on the radio. I understand having "faith" in your team, but even Kenyon knows what's real. Oh well it just makes for a great potential rivalry in the west! NBA season please start now. 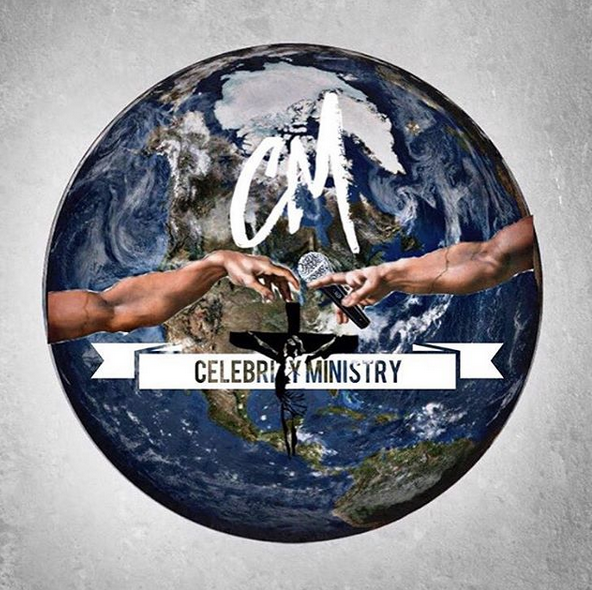 MixTape Alert! For All LakerFans!! ****be on the lookout for September 7th's new Lakers mixtape dropping September 24th featuring new unreleased music on the 2009 season that got us here..."Back On Top"
Banner 16, we're on our way. Lil Larry stays with its true owner for the 2010 season and beyond! Lamar Odom To Marry Khloe Kardashian on Sunday? I have no words for this union. It's no secret that I am and have always been a Los Angeles Lakers fan, and re-signing Lamar Odom helped to solidify our championship hopes...but this has me "worried" a little bit. How is Lamar focusing on up coming training camp, with all this fiasco going on? I know my girl over at Necolebitchie.com think Lamar is trying to garner attention, but I don't think that's it at all. Lamar Odom plays for the Los Angeles Lakers, the world champions and getting attention is no problem. We can see that from the daily up to the minute for 31 days of his free agency. But I surely don't understand how this man, who was dating Academy Award nominated Tarij P. Henson earlier in the year, decides to date and marry (in less than a month) Khole Kardashian...and without a pre-nup? Now I am a firm believer in when you are ready to marry someone, you are saying I trust you with all that I have...but I'm just not sure about this? But like a friend said...who knows how much the Kardashians are worth? So for this fan right here...long as Lamar does not allow this to interfere with our championship run...whatever! Cause we all know that he is a very emotional guy. E Hollywood has already dumped 300k to pay for this ceremony. Why are they rushing? Is someone pregnant? Soooo apparently the Kardashian family are selling pictures of the wedding to different magazines… Highest bidder gets them. They are taping the wedding for the show Keeping Up with the Kardashins - Spinoff show already planned for Lamar and Khloe. SparksNation...stand up, take your shirt off twist it round your head like a helicopter! Let the confetti fall, cause we are in the Western Conference Finals. 2 days of rest and the Sparks will be back at it again versus the winner of the San Antonio SilverStars and the Phoenix Mercury. When it comes down to it, doesn't matter who we play. But ask me do I want to play San Antonio again, and the answer is a resounding YES. That 1.2 sec shot by Sophia Young still haunts me. Not to mention I had someone attempt to argue me down that Sophia Young is better than Candace Parker..still shaking my head at that one...not even on Candace worst day. Phoenix on the other hand is an entirely different animal. There is another CP in the league, and trust she not half bad...lol. Cappie Poindexter is nothing short of the truth. Diana Taurasi get's the shine because she was there first, but Cappie is like Cynthia Cooper, Kobe Bryant all rolled into one player. People lately been talking about her "hairstyle" or lack thereof, and to me it's just a statement. It says-I'm not worried about anything (not even my hair) or the way I look, until my mission is complete. Well Cappie, I hate to be the one to break it to you, win or lose against San Antonio, your mission will be stopped short of reaching the WNBA Finals. This season belongs to the legend, Lisa Leslie. Nash still Salty about Gasol Trade? I remember a while back Nash spoke out on the “unfair” Pau Gasol trade. He still seems to think the Suns won’t be able to compete with the Lakers since they got Pau. Yahoo: “It’s tough to say you’re a contender when you look at the Lakers,” Nash said. “The Gasol thing changed everything. Any team in the playoffs that was given Pau Gasol and didn’t really have to give up anything, that would have a big impact on your team. 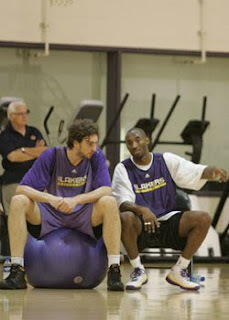 I think anyone else [with Gasol] would be sitting in the position the Lakers are in now, too. One thing is for sure..."it's not for lack of trying" that Ron Artest rap skills are something to be desired. Yet I still love him. SparksNation holla at ya girl! That was a hard "pill" to swallow last night. It took me about 2hours to "begin" to shake it off, and yet I still have not succeeded! I can tell you one thing I am though, mad. I'm ready to see my team impose their will on this Storm team. Let's be clear, I'm not crazy...I know that they have some good players on their team, but the leading scorer is out, the lil general is their (Sue Bird), but these "role" players are treating our olympians with no respect. Now this was the pick that sent me over the edge last night! You see that elbow in Candace's rib cage, Ashley Robinson is the "bully" for this Storm team, and last night she had her way. She was pushing, shoving, and carving out space all night long for her fellow teammates. We all know that 1 on 1, Swin Cash cannot do anything but shoot jumpers against Candace Parker, but with picks like that she at the rim. All I want to know is, where are my players at? Tina stays intense, but the rest of the team letting things go! I want bullies! Lisa Leslie this is your FINAL year donning the Sparks logo (the team you built), we need you now more than ever. I have seen you for 12yrs have your way on the opponent, and Batkovic-Brown will not "cost" you to a title or send you to early retirement. Remember anything less than being in the finals is an early retirement. Get her out of the paint, and Ashley Robinson want's to be a bully, show the youngster how it's done. Delisha Milton-Jones I am CALLING YOU OUT. I have watched you score relentlessly in Washington, and we all know your defensive skills. But last night I saw something from you that I never thought I would see: We up by 1, and you "allow" Camille Little to make a "non-contested" lay up?! I just knew you were going to darn knock her head off if you had too, sending her to the line, but you "gave" her the basket. Even Tina was swinging at her, she just missed. Now I know we got a lot of "new" fans because Candace Parker joined the team, but I know your "name and I know your worth" and last night, that just wasn't it! When you step on that court tomorrow, I hope I see "D NASTY"...Sunshine can come out when the clock hit's 00.00! Honestly, I really don't have anything to say about the way Tina played last night! We all know that if she was coming off the bench, she would have been 6th woman of the year. She definitely get's my "iron woman" award. She leads the team in minutes played, and "SWAG LEVEL RAISED"...so I hope everyone else will feed off of that. I think this is the problem we run into with all these Superstars on this team...no one has been established as the go to player. This is the playoffs, nominate the player, and let's do this! Now for the reigning MVP...Candace "R U Serious" Parker! We need you to let GO! It's time for a "R U Serious" moment! For those who may not know what i'm talking about,R U Serious (1:15) mark. I know it was 2yrs ago, but what I'm talking about is the fire she had in her eyes. I know everyone trying to stay "humble" on this team, but we need that from Candace. This will be her team after Lisa leaves, and their is no time like the present for her to assert herself. 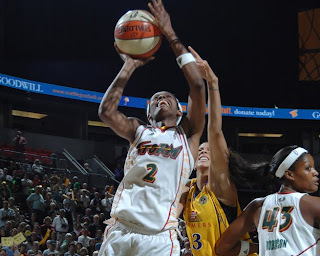 Candace when you have Swin Cash taking you to the block, and scoring, it's time to reach down deep and do your thang! I know Swin is a good player, but have you seen how she looks when Candace is coming at her 1 on 1, like a deer in headlights (check the pic above). Let's be clear, their is not one player in the league, that's not on The Sparks team, who can check Candace one on one. Now with that being said, she has great assist skills, so people keep moving, she will get you the ball. On Sunday, I want to see the olympians get it in! It's time to impose "our" will on the Storm. I'm not looking "past" them by no means...cause just from looking at the regular season matchups we knew that the match up will be intense. I only hope that Michael Cooper will play the "match ups and the hot hand"...Betty Lennox has to be on the floor, she is the best rebounding guard we have. Oh and Ashley Robinson, thanks for waking up the "bullies." We got to get this going! Parker and Leslie are the backbone of this team, and it's time to stand tall! The Lakers will add even more international flavor to its roster with the signing of swingman Mickael Gelabale, who will be the second French player in franchise history after Ronny Turiaf. The former Sonic will join the team for training camp on a make-good contract. Win #1!!! One more Sparks...San Antonio we will be waiting on you. Is Candace Parker Ready To "Marry" The Los Angeles Sparks? SparksNation what it do? On April 9, 2008 our Los Angeles Sparks "proposed" to Candace Parker. They rolled out the purple and gold carpet for her, and let her know from the beginning-when Lisa Leslie retires this will be her team! Well that time has come, with Lisa Leslie announcing at the beginning of this season, that she will retire at the end of the 2009 season. With all of Lisa accomplishments, one that we as Sparks fans can really appreciate is the fact that she "married" the Los Angeles Sparks. We knew that when she retired, it would be in a Sparks uniform. She is nothing less, than the greatest female center to play the game. Now she is leaving the organization she built...and I mean that literally, from promotion, to community events, Lisa has done it all to make sure that the league would be around for the likes of Parker, and others. So now comes the time for Candace Parker to decide if she will accept the proposal for a "career" commitment to the LA Sparks. SparksNation remember Candace's husband Shelden Williams plays in the NBA, and I won't hold it against him, that he plays for the Celtics, but that means she can make her home almost anywhere. She constantly talks about how "expensive" it is to live in LA...lol, yet we know she isn't truly worried about that. 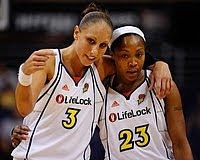 I'm just saying the things she have to consider, before setting the date, after they win the 2009 WNBA championship. Ok enough of that...we know that Candace will indeed "marry" the Sparks...she is more than ready to continue the house that Leslie built. By the time Candace is done, and ready to retire, they will have to share that floor...lol. We will watch this marriage begin next season!